Malay chickens can stand over three feet tall. 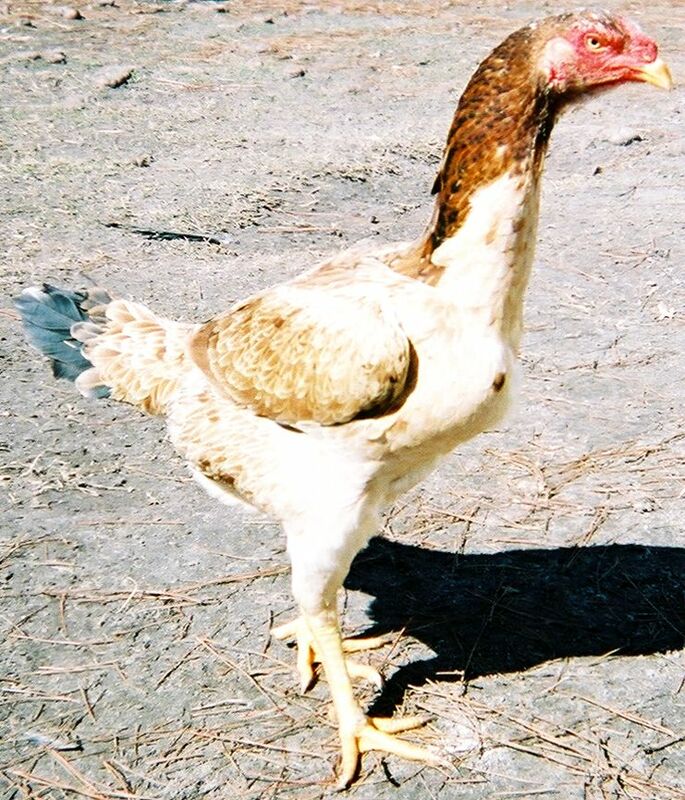 Bred originally for cockfighting, owners today keep them primarily for exhibition. They lay one egg a week. At best an older hen may lay fifty eggs a year. Malays have a lean, tough carcass that usually requires special cooking preparation. Although a rangy, aggressive fowl, they lack hardiness. Malays do poorly in confinement. Why do poultry people keep them? Breeders have used them quite effectively for regenerating and improving other Asian fowl. 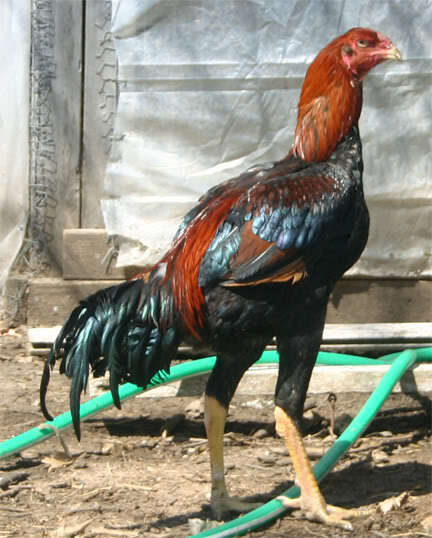 In addition, the Malay stands tall and entirely unique in the world of chickens. Raised to fight, the Malay chicken displays a fierce aggressiveness. A Malayan hen will kill chicks from other hens if they come to close to hers. Of course, the roosters will always fight given the opportunity. If an owner has too many Malay chickens in confinement, they will eat each others’ feathers. Malays make poor pets. Small scale farmers have a Malay around just to perserve the breed or for a conversation piece. Few poultry people choose to have a flock. 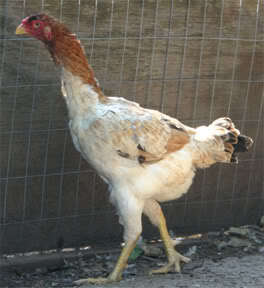 The Malay chicken gains its height from a combination of long legs and a long neck. Slender in stature, the Malay rooster weighs nine pounds of pure muscle. The hens weighs seven pounds. 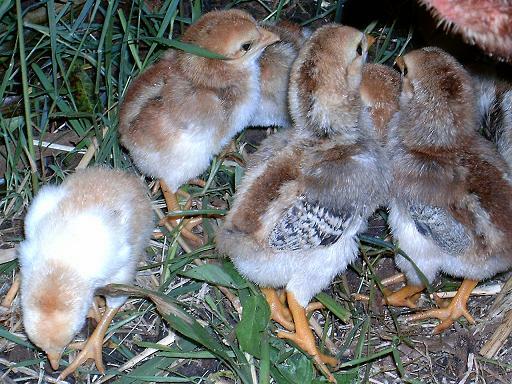 Poultry experts classify the Malay and other fighting breeds as “Asian Hard Feathers.” Malays have glossy, firm, and narrow feathers that fold on one another like armor close to the body. They have little fluff or down underneath as common to other breeds. Their feathers fail to cover the entire body leaving the throat and face naked. The Malays have a fierce and cruel looking face heightened by their overhanging brow and sunken pearl colored eyes. Their face ends in a short but broad hooked beak. Razor sharp spurs complete the picture of this very intimidating fighting fowl. Malays come from Asia and have little tolerance for cold. Provide a warm coop for colder weather. Keep the number of Malay in your flock low as they have low tolerance for each other especially in confinement. Malay hens with sparse feathers have trouble covering eggs. Provide an incubator if necessary. Separate hens with chicks. Keep roosters apart. Introduce any new chickens into the flock slowly. Provide room for victims to escape attackers. Malays like to aggressively dig when foraging. They need the exercise to maintain their muscles. Provide them room for both foraging and exercise. Experts believe that the breed may have descended from the great Malay or Kulm chickens of India which might make them the oldest breed in the world. In any case, the Malay chicken qualifies as the first of the gigantic Asiatic fowl introduced to the western world. They arrived in England in 1830, Holland and Germany in 1834, and the US in 1846. The American Poultry Association recognized the Black Breast Red Malay in 1883. Other variations earned a place in the Standards of Perfection in 1981.